Find all the tips for making recipes to for successful weight loss on the Dukan Diet and enjoy losing weight. 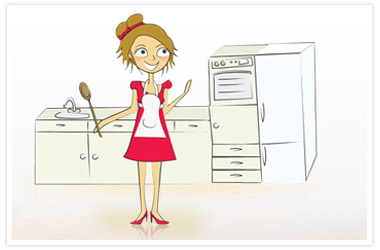 Make Dukan recipes in an instant and find your new culinary talent! Both dieting and exploring a world of flavours is possible with the Dukan Diet. 1. Use as many of the “100 allowed foods” – lean proteins, adding non-starchy vegetables on PV days. Consider the seasonality of the 100 allowed foods to receive their maximum nutritional benefits. Choose plain frozen vegetables and you can you save preparation and cooking time. Important: do not forget your daily dose of oat bran which is the basis for the preparation for the Dukan galette (pancake). Do not forget that wheat bran will help you prepare Dukan meals and baked goods. You can prepare some delicious muffins: Remember to beat the egg whites until stiff to create a volume and a fluffy texture. 2. Choose tolerated food items wisely because of their carbohydrate and fat content. Starting from the Cruise phase, you can have up to 2 tolerated items a day. You can use them to make recipes more tasty. For example, as a substitute for flour you can use cornstarch to make a creamy sauce. Marinate your meat, fish and poultry to tenderise them before grilling: use lemon, soy sauce, salt, freshly grated ginger, etc… Use non-stick pans, silicone molds for baking the muffins and cakes, parchment paper for tarts, pies and cookies and bake in foil dishes. Use a steamer and microwave your meals. 4. Counteract the lack of fats with a variety of seasonings. Think outside the box; let your taste buds discover new flavours: Add spices, herbs, condiments (onions, garlic, shallots, Dijon mustard, etc…) to give a new dimension to your meals, especially during Pure Protein days. Try new combinations: white fish and vanilla, chicken and cinnamon, shrimp and ginger, etc. 5. Revisit classic recipes and make them Dukan-friendly by replacing the ingredients with equivalent approved Dukan foods. Replace white flour with oat bran, cornstarch, fat-free powdered milk, Agar-agar, or konjac powder. Replace pasta with shirataki noodles and use seasonal vegetables instead of potatoes, low fat cheese instead of regular cheese, skim milk instead of cream, or use silken tofu or fat-free cheese. Here is an example: make tuna salad by replacing butter and cream with fat-free plain Greek yogurt and add any spices or herbs (dill, peppercorns, shallots.) Be sure to check the Dukan Menu of the Month. If you like cooking, be creative! Or let yourself be guided with the hundreds of recipes you’ll find in the Dukan coaching programme, which help you to be become more independent while dieting. Feel free to share your recipes in our Forum!